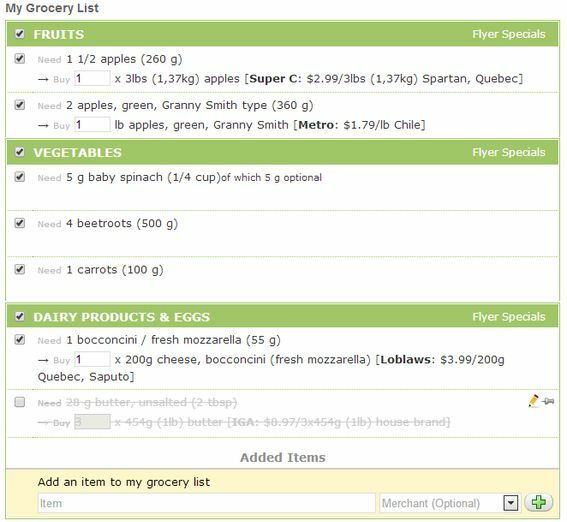 Your grocery list is generated automatically based on your meal plan, even if you have modified it. It is organized, personalized and always within reach. Here is a tool that will make your trips to the supermarket quick and easy! An SOSCuisine exclusive! The list is connected to the flyer specials and rebates. It tells you where to buy the ingredients that you need, to help you save the most. The shopping list is organized by grocery departments, and by supermarkets, so you don’t waste time running from one aisle to another. It indicates the total amount of the ingredients required for preparing all the dishes in the meal plan. So if milk is an ingredient in 4 recipes, we will indicate the total amount required. 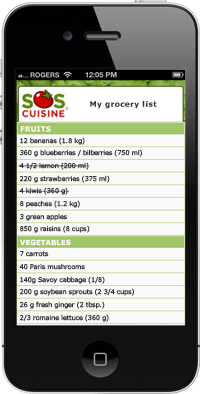 The grocery list is accessible from your smartphone, so you will never forget it again! Click on the items as you put them in your basket to strike them off your list. When you are satisfied with your list, click on the “printer” icon to print it. The SOSCuisine software takes into account the supermarkets that you’re interested in. The grocery list is generated according to the flyer specials offered by the merchants that you have selected. The more merchants you select, the more items on sale, and the more money you can save. The boxes on the left, which are checked by default, allow you to include or exclude items on the list. 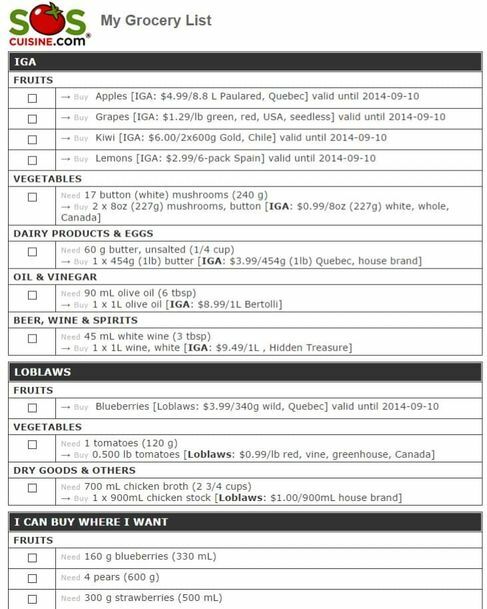 When you check off an item, the total cost of the Grocery List is automatically adjusted. If you need more or less of certain items, adjust the necessary amount in the box “Buy”. 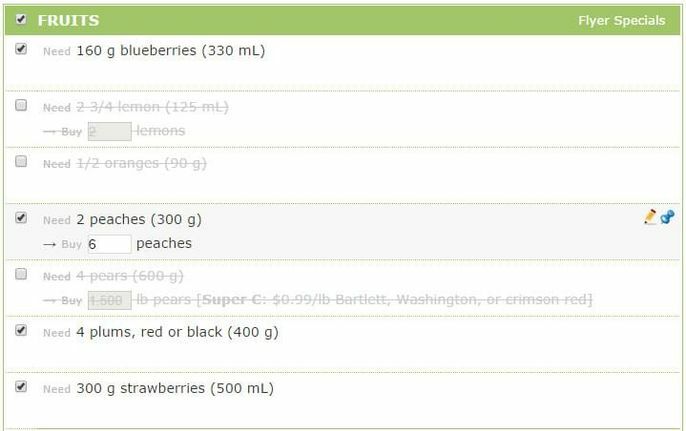 For example, if the basic list indicates 6 lemons, and you already have 3 of them at home, you can accordingly adjust the amount. Your list lets you to add items that you require. This information gets saved, and so you will not forget anything! 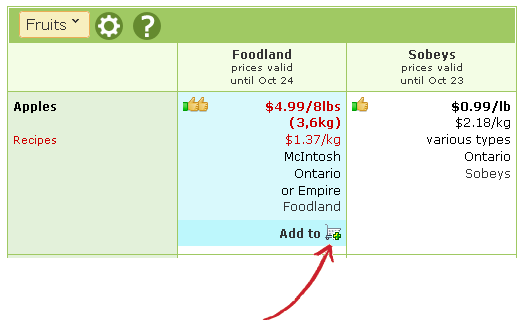 You can also add items to your Grocery List directly from the Flyer Specials comparison table. Simply click on the “Add to my Grocery List” item! You can even do so from scratch, starting from an empty Grocery List. The items added to your Grocery List will be shown with exactly the same information as published in the flyers, so you can find them quickly in the store.